I’m not usually one to wear all black a lot, and it’s funny because even though I’ve been anxiously awaiting spring like the rest of us, now that the weather is nicer, I’ve actually been wearing more all-black outfits than usual! 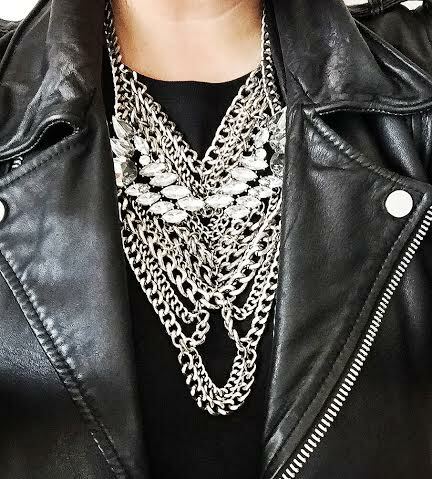 For me, all-black isn’t about a personal comfort zone, but usually more about a canvas to showcase an accessory– like this Baublebar necklace. Also, these Forever 21 pointed toe mules kind of beg for an all-black ensemble…and can we talk about how this is my first pair of shoes from Forever 21!? I mean, the store was a mainstay for “going out” tops in college, but I don’t really shop there on a regular basis anymore…I try and stick to my quality over quantity mantra…but when I saw these there for less than $30, they reminded me so much of the Celine ones that I’d been dreaming of…so I picked them up on a whim and basically haven’t taken them off since. 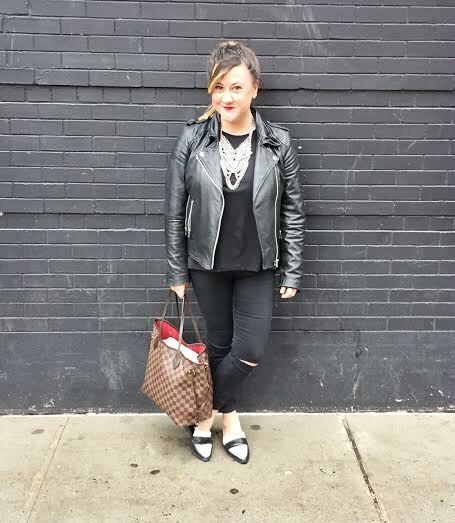 The pointed tow, masculine shape brings a sharpness and newness to old or typical outfits– I’m kind of obsessed. These are a good example of using a cheaper version of something to try out a trend without committing to the big time version– will the Celine loafers be in my future?? You never know! Speaking of “style for less” items, I’ve also been loving the armor-inspired jewelry by Dylan Lex…her pieces are super chic, tough, edgy and very cool…and even though my love of gold will never fade, her pieces definitely could carve out a niche in my jewelry wardrobe. 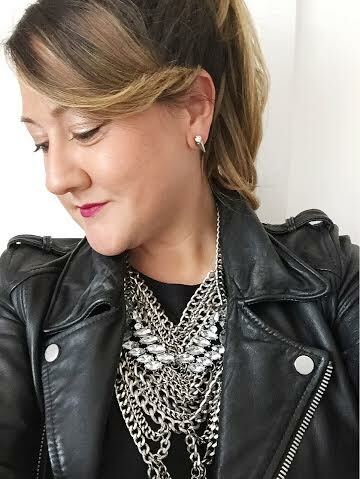 The only issue is that they run a good $500 for a necklace…so when I spotted the necklace I’m wearing here at Nordstrom’s Baublebar section, fashion lighting struck! It’s pretty perfect, for under $70! 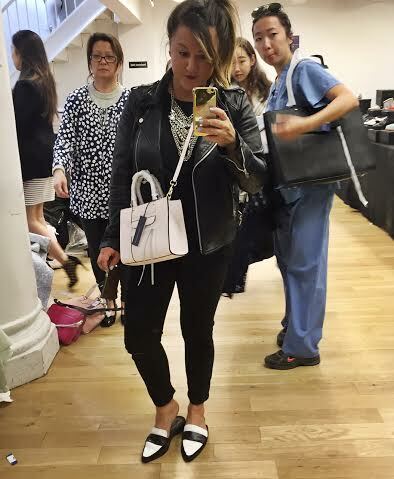 So I wore this look when I stopped by the Rebecca Minkoff Sample Sale (running until this Saturday, April 25th at 260 Fifth Avenue, NYC…also online!). 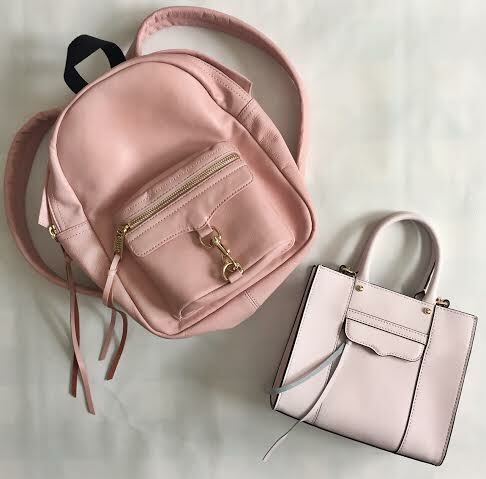 I ended up trying on and getting two blush colored bags–one, this mini MAB tote and the other, this leather backpack…which I basically had to peel off my back when I got home, that’s how obsessed with it I am already. Stay tuned to see the mini backpack, in all it’s 1990’s glory, in action! Rompers are by far, one of my favorite things to wear– they can be casual, dressy, cute, sporty– really anything you need them to be…and you can move freely in them (although going to the bathroom leaves you feeling a little…naked lol). I have a few (ok, more like alot of) rompers in my closet, but if you’re new to the romper game and haven’t worn one since you were under the age of 2, I suggest you get an “LBR” (copyrighting that! 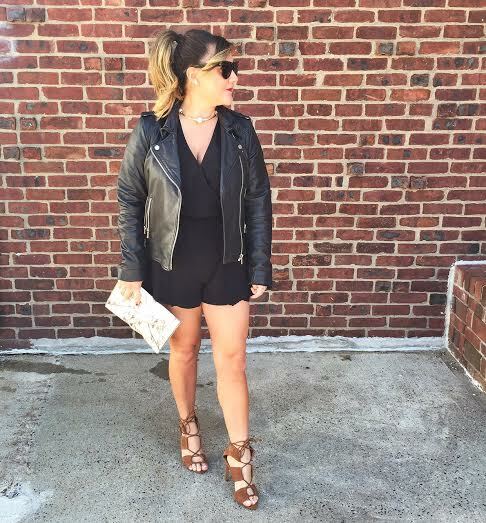 ), or Little Black Romper (or jumpsuit) stat! 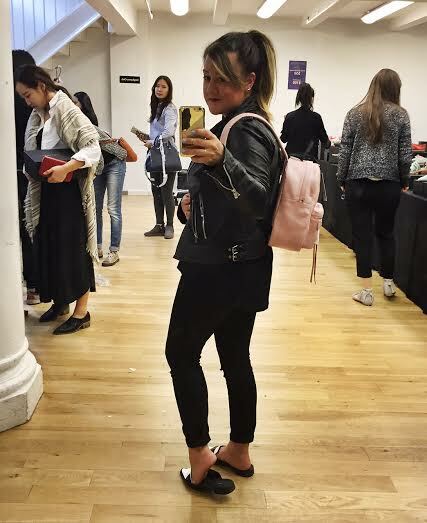 I wear this one from Nordstrom’s ASTR with Converse and a denim jacket, with laceups and a leather motorcycle jacket (seen here), or with a blazer and pumps…it is definitely one of the most versatile pieces you can have! 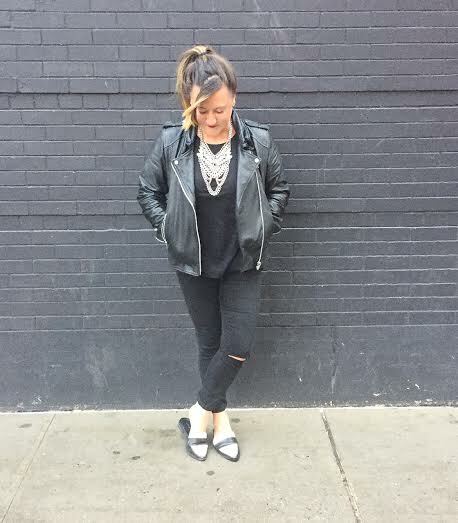 I wore this outfit to brunch at Bagatelle this past weekend…the laceup suede heels are a new Zara find (obsessed) and the leather jacket is pretty much my second skin at this point…I feel more “me” with it on! My particular romper is sold out at Nordstrom, but I’ve compiled some of my other favorite LBRs for you to shop below! The ULTIMATE city for people watching (!!! ), my favorite activity! 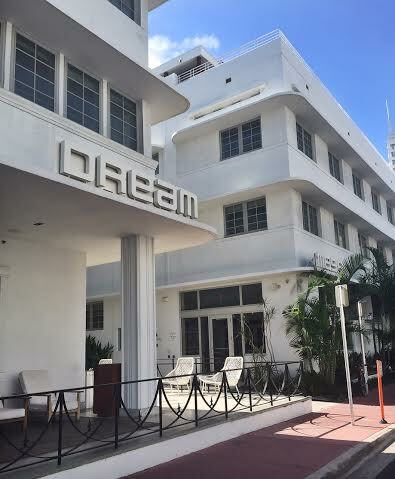 The South Beach Dream Hotel: Perfect location…right in South Beach, walking distance to all restaurants and shops, with its own beach access and a rooftop pool! 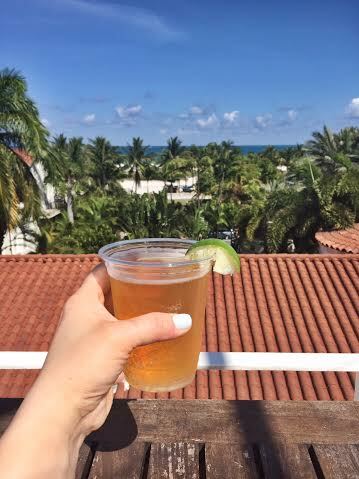 Cheers on the Dream rooftop! 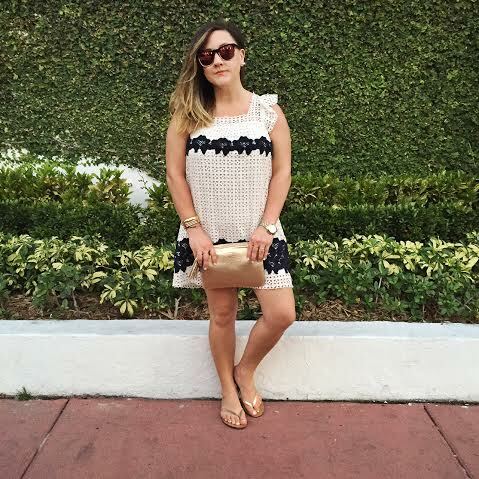 First dinner outfit: A little white dress is my Miami nighttime uniform! This embroidered eyelet one is from Zara, with Wildfox sunnies and J.Crew metallic sandals — flats were a must since we walked to dinner at Joe’s Stone Crab– a Miami institution. 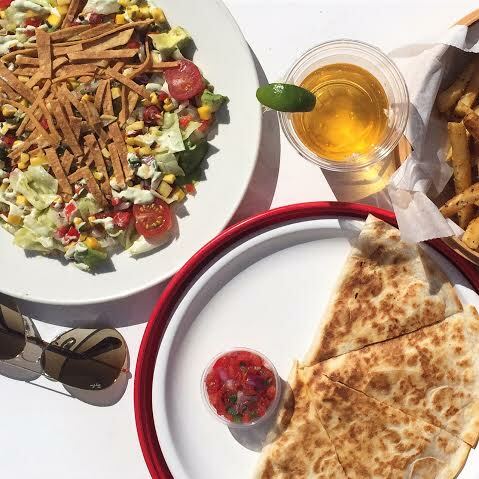 Next time you’re there, you must eat here– even if you don’t love seafood (I feel bad for you), their sides will 300% make up for it (creamed spinach, lime-chili corn…). It’s been open for 102 years (!!! )and has a distinctive “rat-pack” 1950’s classic feel to it…like Frank Sinatra should be sitting at the table next to you…they don’t take reservations, so come early and have a drink at the bar while you people watch! 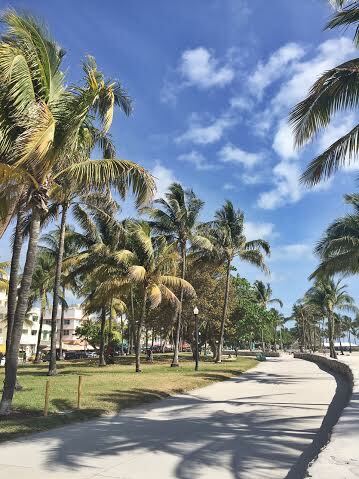 Ocean Drive palms & cafes…our favorite place to run in the mornings and ride bikes in the afternoon. 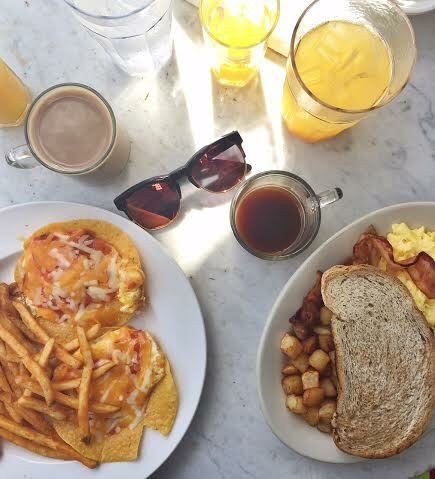 Breakfast (the Huevos Rancheros is mine!) 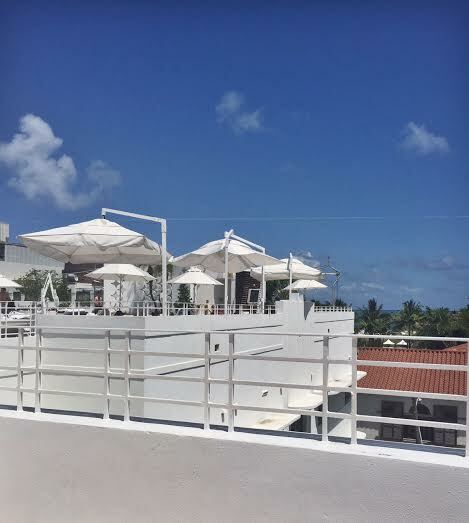 at the News Cafe is a Miami must– a little touristy, but great service, awesome breakfast choices, and tables right on Ocean Drive. 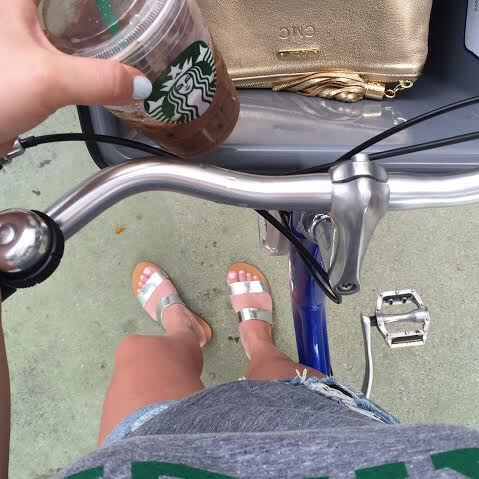 One of our favorite things to do on vacation is to rent bikes and explore– Miami has Citi-Bikes for rent on almost every block– for under $20 you can spend hours exploring the city (and getting iced-coffee at Starbucks). 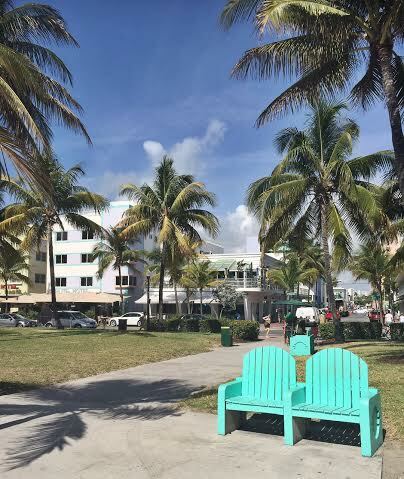 We rode the entire boardwalk and up to Lincoln Road, one of the best outdoor shopping plazas I’ve seen. These J.Crew sandals are great for a bike ride because they don’t slide off your feet too easily! 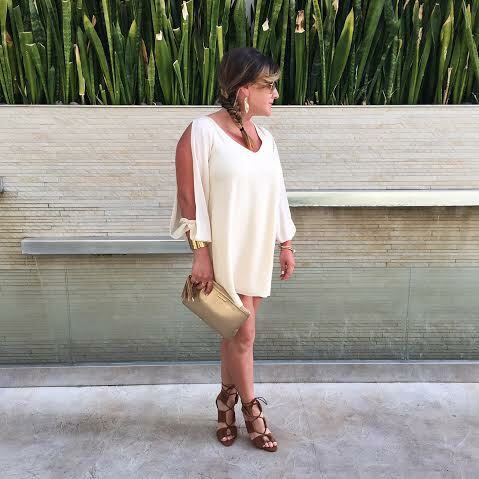 Dinner outfit #2: I told you that a little white dress is my Miami dinner/night out uniform! This one is one of my all time fave white dresses– I’ve already worn it to a graduation, a white-party barbecue, and to countless summer dinners. It’s by LoversandFriends, a favorite designer of pretty affordable but stylish dresses. The lace-up sandals are, surprise!, a Zara find! I plan to wear these with just about everything this spring and summer. 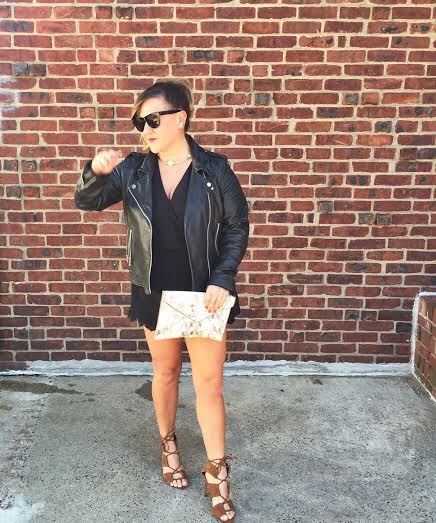 I wore this outfit to dinner at Dolce Italian, the winner of the Bravo TV show’s Best New Restaurant show. The service, decor and food did not disappoint one bit…best spring pea soup and lobster ravioli of my life! 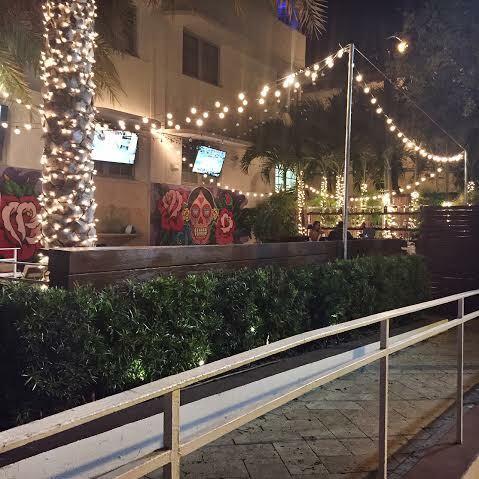 Sitting area & bar outside the Dream– how pretty are these lights?! 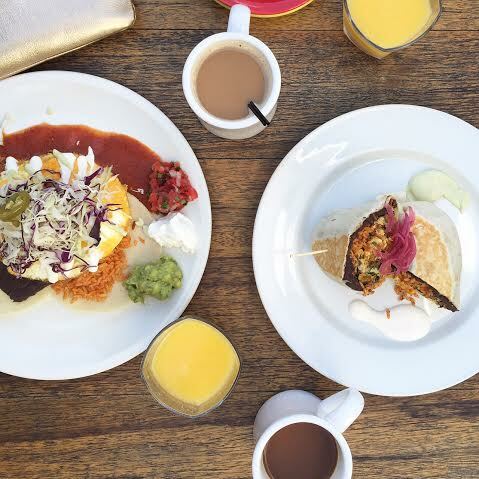 Huevos Rancheros (yes, again) and a breakfast burrito at the Dream’s Naked Taco. 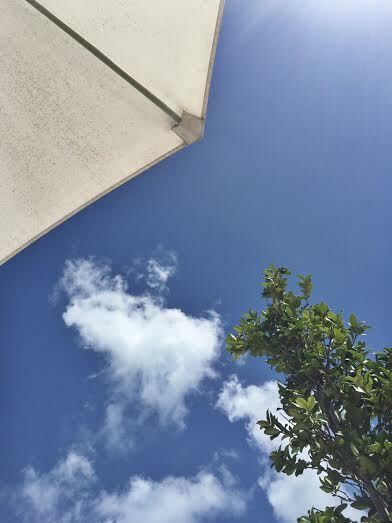 View from my poolside lounge chair, on the roof of the Dream. Casual outfit for our last night’s dinner: This Minkpink printed romper is my go to piece for a casual summer event or dinner where I know we’ll be walking or exploring or shopping …it’s so easy to wear and manages to feel dressed up and casual/comfy at the same time. The tote on the floor is my travel/vacation/summer tote– a raffia Yves Saint Laurent purchased ten years ago and worn every single summer since <3…I like to think there’s a grain of sand from every beach I’ve been to in the bottom of that bag! So that’s it you guys! 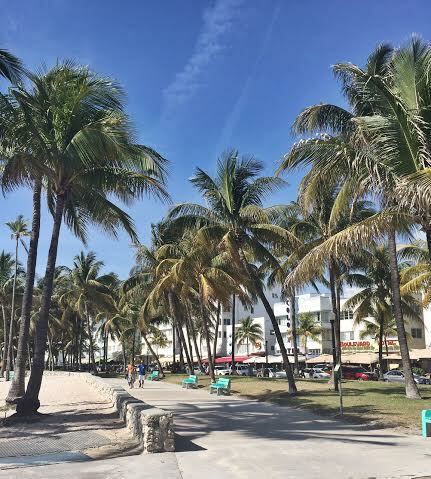 My perfect three day Miami getaway! Hope this inspires you to book a trip there and visit some of the spots I mentioned– I promise, you’ll fall in love with it too! Like most girls out there, I used to suffer from SEVERE over-packing syndrome. The fear of not having what I wanted to wear with me, the “need” for options, and general indecisiveness left me lugging pretty much everything I owned (all my “favorite” things) with me on various adventures– and without fail, I would ALWAYS return home with half of the stuff unworn (and even worse, now wrinkly and in need of a wash or dry-clean!). So I’ve tried, over the past few years, to apply the rules I follow in life in general– simplify, quality over quantity, be content with what you have, and the Tim Gunn favorite “make it work”–to my packing strategy. 1) A romper (preferably printed): Rompers are great for vacation/packing because like a dress, its a one-piece outfit, with the added bonus of mobility (lol)– you can jump on a bike during the day, which is a given when Tim and I go away– we love renting bikes on vacay!– and wear it straight through the day into a casual dinner. 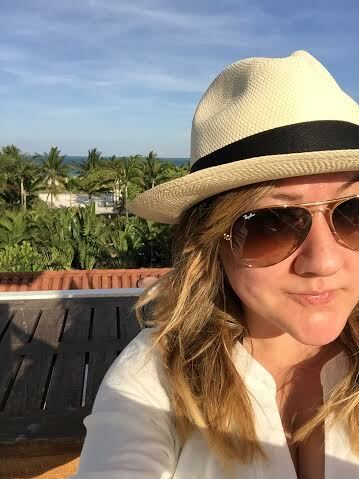 2) A Panama hat: Other than obviously providing shade, a hat is the lazy girl-on-vacation without a blow dryer’s best friend…tuck a side braid or low bun underneath, or keep your beach waves down and -voila!- instant style. 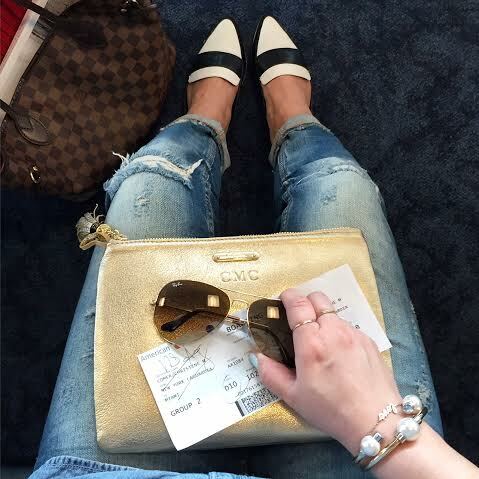 3) Gold or metallic leather sandals: Every summer I get at least two pairs of metallic sandals from J.Crew and basically live in them until October– they go with literally EVERYTHING, and are super easy to pack. 4) White Cover-up Dress: I’ve collected quite a few pretty printed cover-ups over the years, but really, when it comes to efficient packing lists like this one, a white cotton cover-up dress is the way to go. 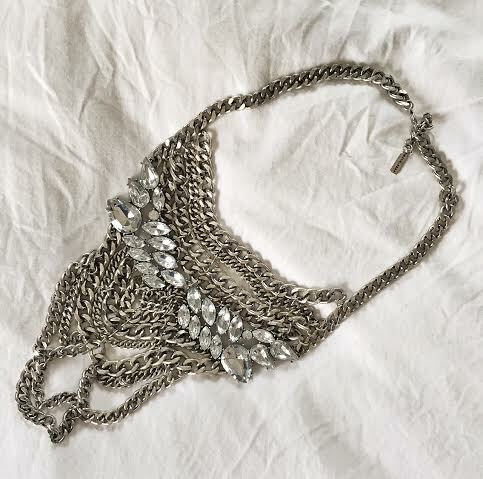 It will pair with any swimsuit, and with a tank underneath and dressier gladiator sandals, can go straight to dinner. 5) A Printed Bikini or Swimsuit: This old Vitamin A ikat print bikini is an old stand-by, with good reason. Vitamin A (and VIX, my other favorite swimsuit brand) make superior quality bikinis– yes, they’re definitely more expensive, but they seriously last for years! I love a printed bikini for vacation, if I have to pack only one (although a second favorite may sneak into my luggage…) because a fun print just feels like vacation to me! 6) A white lace or crochet dress: There is nothing better than a light and breezy white dress to show off sun kissed skin, am I right?! Always pack a white lace, embroidered or crochet dress for a summery getaway– easy, comfortable, with a slight bohemian flair– that’s how I like both my dresses and life in general! This dress can be worn during the day with the gold sandals, or at night to a dressier dinner with the lace-up heels. 7) A heeled or wedge sandal: The only other footwear you need to bring on a short vacation like the one I’m taking are a metallic flat sandal and a heeled or wedge sandal– really, this is me, the shoe-lover speaking honestly– and really, its so freeing not to agonize over which shoes for which outfit– the sandals and heeled lace-ups pictured here are almost interchangeable, depending on what type of restaurant/bar/brunch/event you’re going to– these particularly suede lace-ups can be work with the romper or the dress. 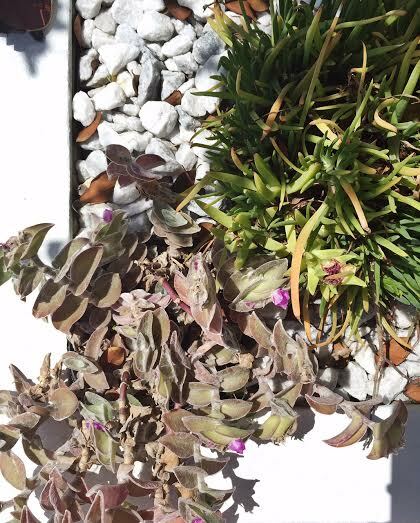 Also, I’d go with neutral colors only for shoes…metallics, wood, cork, natural colored leather or suede, raffia…you get the idea. 8) A cute, casual t-shirt: For those vacay days spent biking around the city, or just to run down to the lobby for a quick coffee, definitely have a fun but casual t-shirt in your bag to pair with the denim cutoffs. 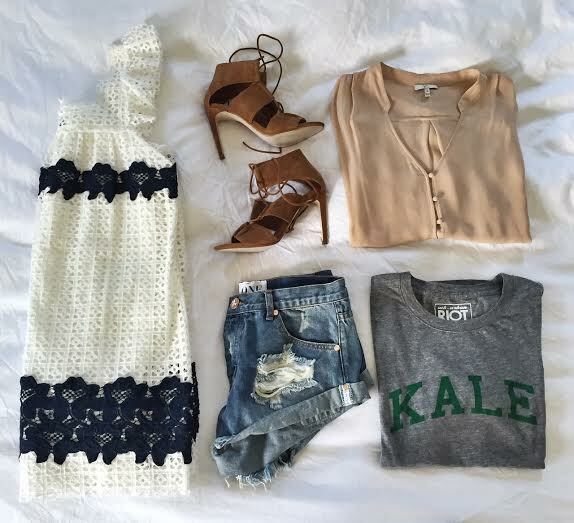 This “kale” tee is my new obsession–beyond comfy, and it makes me smile. 9) A light and airy, dressier blouse: This top you should have to switch out with the casual t-shirt– to go to a less-dressy dinner where you want to wear flat sandals but still want to feel put together…I’ll wear this blush colored, silky tie front button down from Joie (who make, hands down, the BEST silky blouses around) at night with the same distressed cutoff denim shorts I wore with the Kale tee. 10) A pair of worn-in, distressed denim cutoffs: There is nothing that makes me feel more free, happy, and “me” than a pair of my favorite, ripped up cutoffs. When I discovered this One Teaspoon pair, I’ve ordered one new pair at the beginning of every summer since. They are baggy and fitted in just the right spots, and feel like you’ve owned them for 20 years. 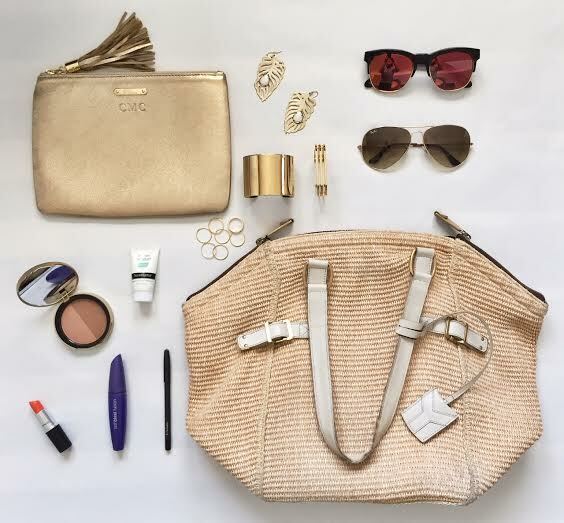 1) A gold, metallic, or neutral leather clutch: This clutch will be the secret work horse of your trip: this zippered and tasseled pouch from Gigi New York will hold my plane tickets, ID, cash and phone on the way there, my hotel key card and cash during pool/beach days, and all my night out essentials at dinner. 2) A pair of dressy gold earrings: I love a pair of gold dangly or statement earring on vacation– normally, in my regular life, I usually do studs, but on vacation, a pair of gold, bohemian-feeling earrings is a staple. This feather pair from Kendra Scott has been pretty much everywhere with me. 3) A pair of gold cuff bracelets and stacking rings: Ok, I can count; I’m aware that this is more than one item– but since I cram all my gold vacation jewelry into one black velvet pouch, I’m counting it as one item! 4) A pair of “fun” sunnies: Like this mirrored pair for days by the pool or with the more casual looks you wear. 5) A pair of classic aviators: These over sized Ray-ban aviators are an old stand-by…you know something is a classic when both you and your 70 year old father both rock them equally as well. 6) A raffia or woven “beachy” tote: This item is a must. It will function as your “day” bag, holding your towel, books, mags, sandals, water, while you’re at the beach or pool or running around the town/city/country/wherever your travels take you. 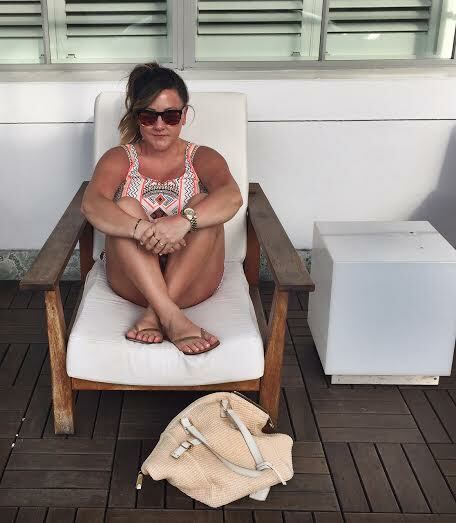 Leather or other materials look way too “formal” in a vacation setting– this is actually a huge fashion pet-peeve of mine– people using the wrong material bags for the wrong occasions! While I’m a true believer in “if you like it, wear it” , leather or patent in 80 degree weather is just not OK. A quick note about this particular raffia and leather tote featured here: I bought this friend about ten years ago, while I was still in college (!!! ), back when “Saint Laurent” was still “Yves Saint Laurent”– and I swear, I will NEVER get rid of it. It’s lined in suede with an inside pocket, which is now full of various grains of sand from many, many beaches in the western hemisphere…big enough to carry all my daytime essentials. 7) Orange, pink or coral lipstick: Because red just feels too “city” and serious for vacay. This shade from MAC, called “Saigon Summer”, is the perfect light, shimmery orange. 8) Bronzer: To highlight that sun kissed glow! I don’t really wear any other face makeup on vacation, a bronzer/blush combo like this one from Too Faced is it. 9)Mascara/Eyeliner: Again, two items, functioning together. 10)Neutrogena Sensitive Skin Sunscreen/Moisturizer SPF 15: Yes, I know that dermatologists everywhere are probably shaking their heads saying “why only SPF 15?!! ?” I tan pretty easily, rarely burn, and just hate the feeling of a heavy, skin clogging sunscreen on my face– this is the ONLY sun product I’ve found that doesn’t bother my skin, or make me feel like my pores can’t breathe– all while keeping my face protected. So guys, that’s my packing list! 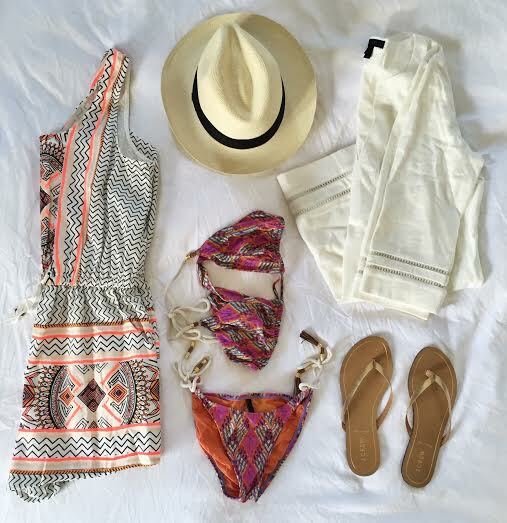 Hope this list helps you pare down your own vacation items list and rethink your packing strategy– follow along on my Miami trip through my Instagram (@thelittlegoldmix) — full vacay post to follow next week!